Ibiza offers a wide variety of hotels with many that won't break the bank. That Ibiza is the top of many holidaymakers' destinations is unsurprising, whether that's for its beaches and crystal-clear waters, its unbeatable nightlife or just it's laid-back, chilled hippy vibe. With so many top-end places making headlines, we thought it time to bring you a selection of accommodation that will fit most people's price ranges. All of these places offer good and honest accomodation and come highly rated. We worked out the under €100 limit by looking at prices in June. A quick cursory review for the month of May sees that figure dip to as little as €50 a night, woo hoo! For more choice, Ibiza Spotlight's hotels' section has a complete range of hotels and apartments island-wide. The excellent value Hostal Marí punches way above its weight for price. You get a family-run, very nicely decorated hotel in San Antonio's quiet historic centre, with nearby shops and eateries. The on-site restaurant does a great lunchtime fixed-price menu, there's bike storage for the sporty ones out there and a superbly friendly atmosphere. Overlooking the sands of pretty little Es Puet beach and offering amazing sunset views - this is only the start with the Osiris Ibiza Hotel. There's a lovely pool, extensive sun terrace, a fitness centre, air-conditioned rooms and a big comfy communal lounge area. Ideally situated, you can choose the peacefulness of the bay or vibrant San Antonio itself. People and pet-friendly, the azuLine Hotel Mediterraneo offers terrific value for guests. Its excellent central Santa Eulalia location means you are only five minutes away from lots of shops and restaurants and the rooms are bright and clean. There's a pool and sunny terrace and the staff cannot do enough for you. A lovely oasis with a big pool area and food served to your sunbed, helps make the Apartamentos Zodiac a top choice for both couples and families. Add in the spacious and bright apartments with well equipped kitchen plus the peaceful setting that's just a short walk to the nearest beach and you have a well-priced package that's hard to beat. Staying at the stylish Jacaranda Apartments gives you great value plus modern and pristine accommodation. You get a welcome bottle of wine on arrival and there is a cocktail bar, restaurant and a supermarket on-site. Especially good when staying here is the access to the adjacent beach club, where there's a big pool to splash in. With just 16 brightly decorated and spacious rooms at the Sandic Apartments, you'll easily meet new people. There are great sea views plus a big sun terrace and pool area where you can chill and relax. Choose from a one-bedroom room with sofa bed or a big family room that'll accommodate five. An on-site bar and lots at your fingertips makes this a great choice. A great place in the heart of San Antonio that has quick access to the beach and seafront promenade and this place is well suited for younger couples. The Tarba Hostel's pool area is peaceful and quiet, rooms are modern with lovely marble-tiled bathrooms and if you fancy a spot of clubbing, you are right next to the bus station for the disco bus, so it's just a short crawl home. Early booking recommended. This is really an away-from-it-all place to take the kids and forget about everything. 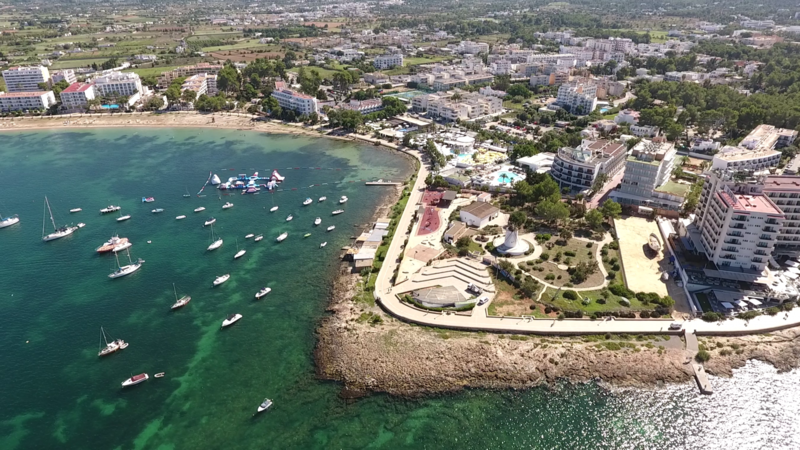 San Miguel Park's studios and apartments are well-equipped, the place has an all-inclusive offering, plus a tennis court, hot tub, children's playground and an evening entertainment programme. Did we mention the jaw-dropping views of the beach to which there's direct access?